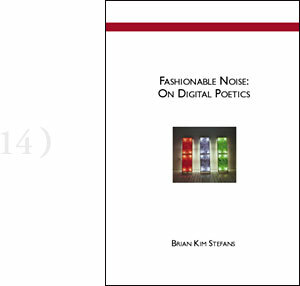 Brian Kim Stefans' Fashionable Noise: On Digital Poetics eludes any singular description — it is too various. At once, Fashionable Noise explodes with ingredients of essay, games, and poetry, and it is always engaging, always thought provoking. How does limitless replication and change affect a dialogue one might try to have with another poet's words? What's so interesting about the hidden code behind the link Walt Disney that misdirects you, takes you to the wrong site? Stefans confronts these questions, and the ease with which he simultaneously discusses, investigates, and incorporates those elements that might make up a digital poetics is astounding. Generating poetry with a computer program, synthesizing Scots by using an algorithm accompanied by dictionaries, employing an ICQ chat transcript as the conduit for delivering a significant discussion on digital poetics: these are just a few examples of what readers will find in this book. Although "the webwork, unlike the earthwork, can never be photographed from a satellite perspective," Fashionable Noise: On Digital Poetics is on the forefront of mapping out a rapidly emerging, constantly morphing, virtual terrain. Brian Kim Stefans is the author of Free Space Comix (1998), Gulf (1998/2000), and Angry Penguins (2000). He has been an active presence on the internet for several years, editing arras.net — a ceaselessly original site devoted to new media poetry and poetics — and creating works such as the acclaimed Flash poem "The Dreamlife of Letters" and a setting of the "e" chapter of Christian Bök's Christian Bök's Eunoia. He is an active literary and cultural critic, publishing frequently in the Boston Review, Jacket, and elsewhere. He lives in New York City.